It’s almost possible to add free and paid user accounts to Webflow sites without writing any code! Add free or paid memberships to any website without writing code. 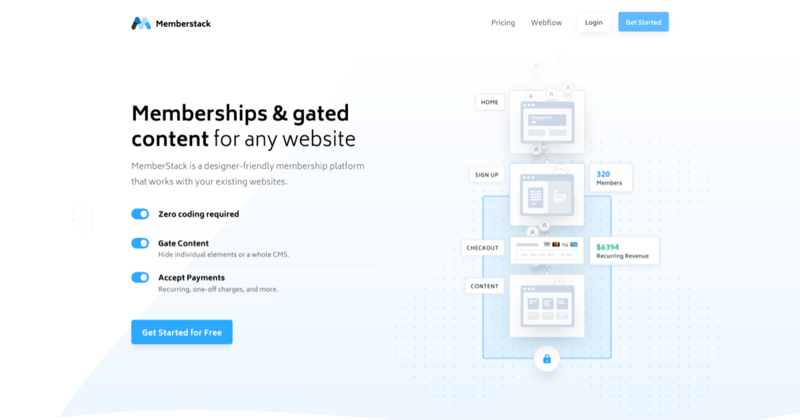 MemberStack is the designer-friendly membership platform you can add to the sites you already built. Feel free to reach out with questions and feedback. Solution for user specific download area… Suggestions? How To Add Premium Content to a Webflow Blog? I can personally vouch for Duncan and AuthRamp! They’re helping us in getting a member-only area on one of our client’s site. Their solution rocks! Possible to let me know what the login can restrict user access to? If we have hundreds or even thousands of users for a site with different billing levels, what functionality is provided to manage that? Can we display content to a logged in user from a CMS that only that user can view? Memberstack is pretty flexible. I’d be happy to jump on a call with you to talk more about your site. We’re working on a project now that allows users to sign up, pay, add profile info, and more all from within Webflow. Please shoot me an email at duncan@memberstack.io. I’ll send you a calendar invite. It’s still being designed, but the numbers are accurate.